'Berry Nice' (Anthony and Dorothy Willott, R. 1999). Seedling #W 94-44. MDB, height 4" (10 cm), Early blooms. 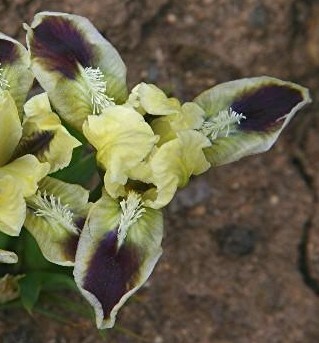 Lightly ruffled creamy white, falls with large red violet spot; beards cream. Seedling #W 92-3: (seedling #W 79-13: (Greenlee seedling #X-2 x 'Buttons') x 'Daring Eyes') X unknown. Willott 2001.